Dr. Jean Fang grew up in Garden Grove, California and attended the University of California, Irvine where she received a Bachelor of Science degree in Biology. Dr. Fang studied dentistry at New York University where she received a scholarship with honors. She completed an additional post-doctoral residency program at the prestigious UCLA AEGD (Advanced Education in General Dentistry) where she studied implant and cosmetic cases. 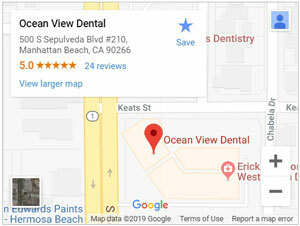 She has been practicing dentistry in Manhattan Beach since graduating. Dr. Fang is a strong believer of evidence-based dentistry and is committed to delivering the best care possible to all patients. When not working to build beautiful smiles for patients, Dr. Fang enjoys many outdoor activities including hiking, biking, traveling, and attending concerts. She is also a devoted yoga practitioner. She has been married to her husband Max since 2004 and they have two children together.